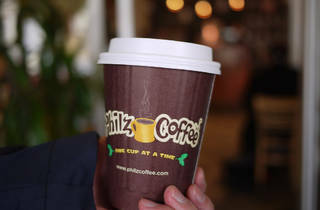 Philz is king of the Bay Area coffee wars, with over a dozen locations in San Francisco alone. The most inviting of the bunch is the Dogpatch location, which also functions as the company’s home office. The happy-go-lucky Philz ethos is evident in the design, from the Warriors and Giants art to the “Cup of Love” lighting. Located directly across from Minnesota Street Project, the cafe is a comfortable place to linger, with floor-to-ceiling windows, long tables, and ample leather couches. Pour over coffee is the specialty—there are over 20 unique blends made from beans from around the world—and each cup is crafted to order according to the customer’s taste. 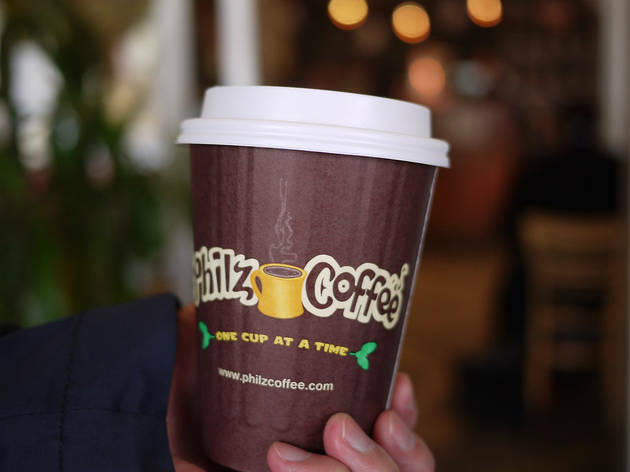 (Try it “Philz way,” medium sweet, with cream.) In addition to coffee, the cafes serve bagels, baked goods from Starter Bakery, sweet and savory toasts, and wraps. A must-try when in the bay area. Everyone loves the mint mojito iced coffee for a reason so get one when it's warm! The store features a bit of a different lay out in how they accept their coffee orders so don't get thrown off if it's not the way you're used to ordering coffee! They'll usually take the order, you can choose to pay before or after, and then you approach the barista when they're ready and ask you to sample your drink to see if you're satisfied before you can head out with your drink! I first discovered Philz Coffee in the Mission District and fell in love with the shop immediately. They have a wide range of coffee selections and the baristas are always super helpful. So happy they opened locations in LA as well!